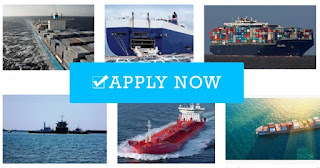 SEAMAN JOB INFO - Inc Navigation Company Philippines Inc. 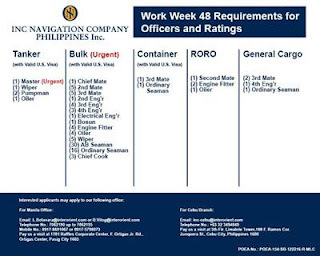 Available hiring for Filipino seaman crew join on tanker, bulk carrier, container, RORO, general cargo ship. Call our office at 7062190 up to 7062195. Look for Capt. Samson Jimenez or Grace Giro to further your inquiry. Pay us a visit at 108 F. Ramos cor. Junquera St., Cebu City, Philippines 1600. 0 Response to "Cook(3x), O/S(18x), AB(30x), Oiler(6x), Wiper(6x), Fitter(6x), 4/E(5x), 3/E(4x), 3/O(8x), 2/O(6x)"